A little automotive CGI project from end of last year featured on AIR-CGI. The following video demonstrates what it takes to combine a fast CG car – in this case a Lamborghini Aventador – together with a photographic backplate and HDR to create a striking image. The backplate was taken at the Shelsley Walsh Hill Climb, which is the oldest motorsport event in the world set in deepest rural Worcestershire. You can read and checkout the video of last year’s August Hill Climb featuring Barrie Whizzo Williams. 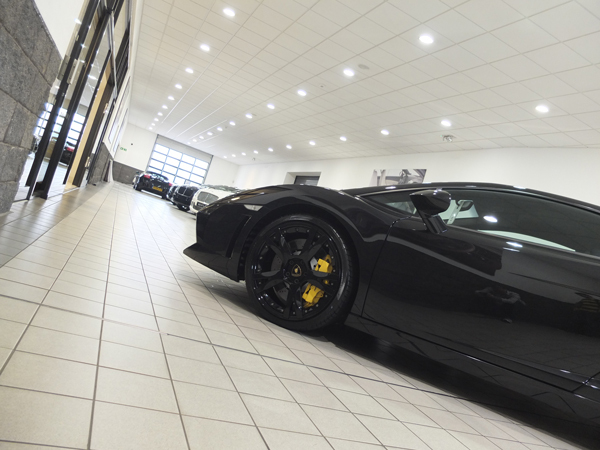 To take material references and check the details of the Lamborghini, we dropped into our local Lamborghini showroom. We then collated and started to analyse the pictures, checking all of the attributes of the surfaces. After visually deconstructing the car, we took the elements and reconstructed this to create the CGI version. So here’s the process we use when doing this kind of work. And this process would also apply to, say, other products we have worked with, trainers, champagne bottles etc.. as much as it would a car driving up a hill at speed. It’s fairly in depth, but worth mentioning. 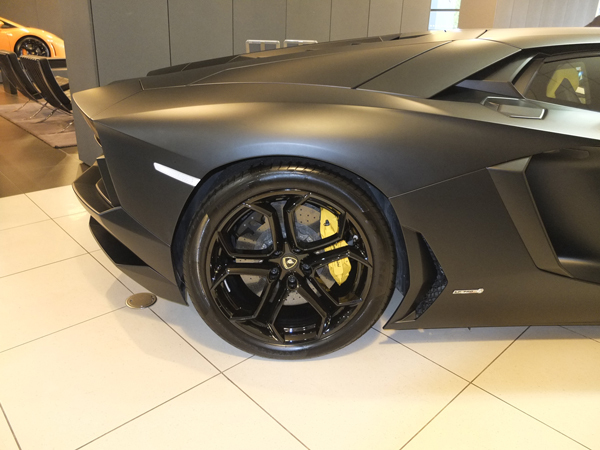 • Initially we take the Lamborghini as a greyscale model. A clone, if you like. Prior to the video we prepped the car in terms of textures and shaders. • We place the backplate into the virtual scene. • So now we’ve got a 3d modelled prepped car, with all the materials on it in the Shelsley backplate. We then create a grid that helps with the perspective and camera matching. • Align the virtual camera so the car looks like it’s on the photographic road. • Once the car is on the road, we create a personalised reg plate and go into more detail of the car components. • The front of the car will not be seen in the final image and so the main focus is the rear three quarters. • The 360 degree HDR environment capture is applied around the car in the scene to provide lighting and reflections. • We begin the retouching stage by applying movement to the static backplate. We generate the shadow underneath the vehicle. 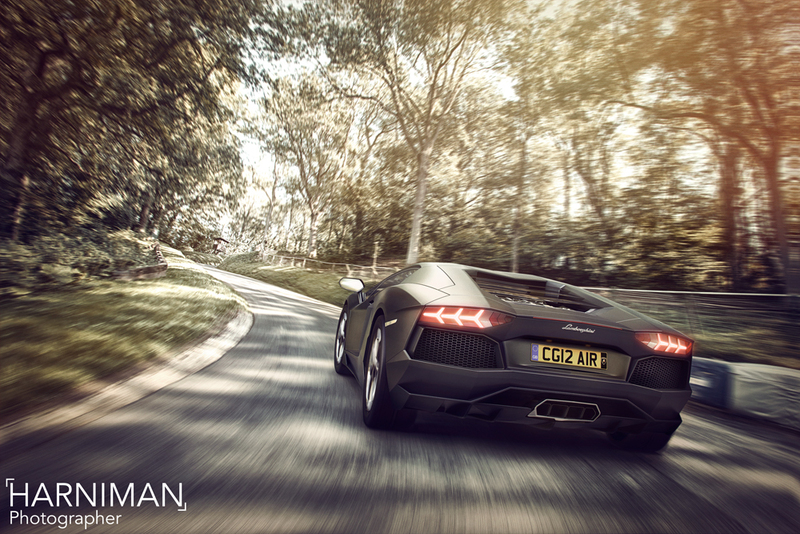 Further tweaking of the grade, highlights and colours help to embed the car into the environment. So even at this stage it requires a lot of creativity and attention to detail to give more shape and definition to the car. We then set the mood of the shot, darken around the trees to centre focus on the car. 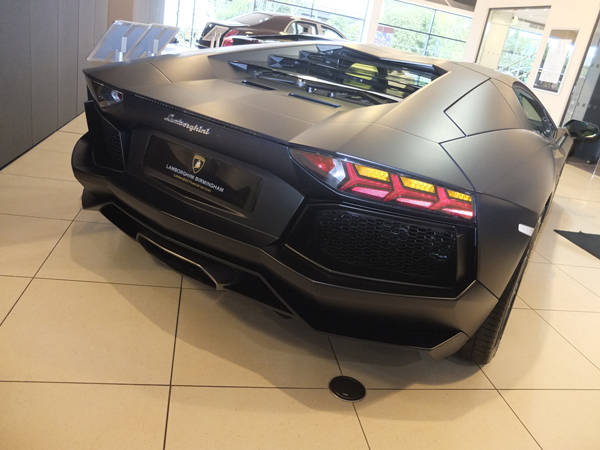 We also wanted to switch on the rear side lights on the Lamborghini. Creative licence allows us to exaggerate sunlight and blooms of colours, so we paint these in, simulating light entering between the leaves and trees accentuating shadows. This gives it more drama. Almost a cinematic effect. And there you have it – the finished Lamborghini gunning up the hill at Shelsley Walsh. You can download the backplates and HDRS and have a go yourself!